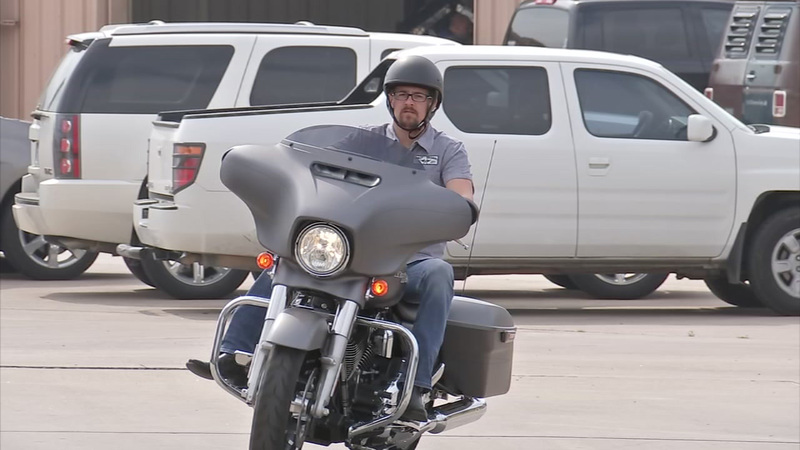 HOUSTON (KTRK) -- May is motorcycle safety awareness month, and even if you don't ride one, we have some tips that could help save a life. "There's a lady in her car drinking a cup of coffee and as she took a sip, she swerved over into my lane. I flew into three cars before I slid across the intersection," Lee says of his accident. Colin, along with several HPD motorcycle officers, gave us three tips to help keep bikers and the drivers who share the road with them safe. First, when a motorcycle is slowing down, you may not always see a brake light. Often a motorcycle rider will downshift to slow down, which will not engage the brake light. "It's very common that that motorcyclist may downshift the gears -- fifth, fourth, third, second -- so you may not see the brake light turn on as they are slowing down to a light," Lee explained. Second, a motorcycle will look farther away than a car, at the same distance. "It just brings the importance of proper spacing," HPD Officer Dane Money said. "If you are on the freeway doing 65, three seconds worth of space is going to be a lot longer than three seconds would be on a side road going 30." And finally, a make sure a motorcycle's turn signal is for real. On many motorcycles, the turn indicator is not self-cancelling, so that means when the rider is done with a lane change, the blinker won't automatically turn off. "So when you use the turn signal, it may stay illuminating long after that person may have gone through a turn," Lee explained. The biggest takeaway? The simple act of being more aware could save a life.